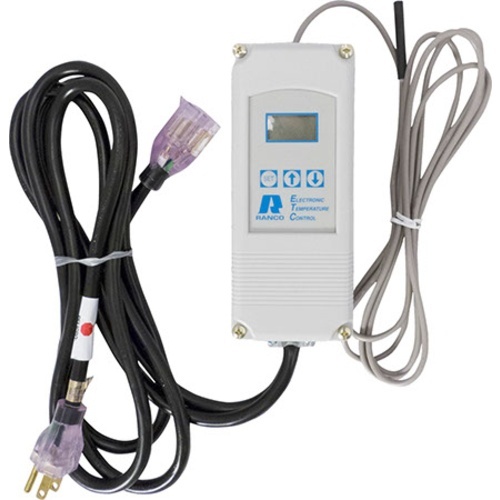 This digital temperature controller will allow you to precisely control the temperature of your fermentation, or a pump on your All-Grain System. To control ferment temperatures you can place the probe inside the space that is being cooled or heated (often a refrigerator) or you can place the probe directly into the ferment using our Stopper Themowell, FE624. You can change from cooling to heating mode directly from the digital control panel. When in cooling mode, and hooked up to a refrigerator or other cooling device, the controller turns the compressor on when the ambient temperature rises above your set point. When in heating mode and hooked up to our FermWrap (preceeding page) the controller turns on the heater when the temperature drops below your set point. A FermWrap around a fermenter or inside a unplugged refrigerator can be the ideal solution for those cold winter ferments. To control a pump when mashing you would install a thermowell in your mashtun. This can be done in our welding shop or, if you have a coupler in your kettle, you can install our Coupler Thermowell, FE622. Ranco base Model # ETC-111000-000. I just got one of these Ranco controllers with an old used MoreBeer conical. I am confused about the "Heating" (Stage 2) set point and why it is different than the regular set point. For managing a fermentation at say 68 degrees, why would I not have both set points at 68? What is the general best practice? I dont want it to be substantially lower and risk the beer dropping 4 or 5 degrees before it starts to heat up again! Also the MoreBeer setup guide recommends 2 degree differential but 1 seems more precise obviously. Why the 2 degree default? BEST ANSWER: Leonard is correct. We recommend a 2 degree differential so that your cooling device, such as a refrigerator/freezer, isn't turning itself on and off too often. It is also recommended that your heating and cooling devices have different temperature set points to eliminate the possibility of both devices trying to engage simultaneously. I use mine on the cool mode only for white wine temp control , later for storing grape cuttings. The 2 degree differential keeps your freezer (mine is for a freezer) from cycling too often. One degree is harder on the motor but certainly doable. Is this wired up in a manner that I could plug in a large refrigeration unit that has a compressor which pulls 12 amps? BEST ANSWER: The specs are: Full Load Amps - 16 @ 115VAC, 8 @ 230VAC. My opinion is, if the compressor runs at 115VAC then it should work. thank you. i found the wiring schematic and it does appear to run through the Normally Open connection so it's within limits. So far, this controller has worked as expected. However, I do have two minor complaints. First of all, the back light on the display times out rather quickly, and it would be nice to be able to adjust that, or keep the back light on indefinitely. Secondly, the programming instructions that came with it do not include any information about the last programming step which I discovered (after some experimentation) is a delay time. Perhaps the controller I received is an updated version and the instructions were for an older version, but it was rather confusing to get to the end of the programming steps and find one more parameter to program that wasn't in the instructions. Other than that, it seems like a pretty good device. It allowed me to precisely regulate the mash and fermentation temperatures on my last brew and I'm hoping that will result in much more consistent results in both stages of the brewing process going forward. However, since there is room for improvement, I have to give it four stars. Thank you so much for your feedback. We have contacted the provided email regarding some directions for the controller. We really appreciate the honesty and value great feedback like this as it helps us improve our products. Cheers! I am setting up a RIM'S system and I have used other controllers in the past I am very impressed with this unit it is easy to set and both heats and cools without changing any wires just a push of the buttons. I used my controller to maintain 70 F in a small enclosed space containing four 5 gal carboys of fermenting wine. It was set to cycle a small heater on and off to maintain a constant temperature in the space to enable malolactic fermentation. Variance was set at 1 degree. The Ranco controller performed flawlessly over a six week period when the fermentation finished. Outside temperature varied from 20 F to 60 F.
I highly recommend the prewired Ranco Digital Temperature Controller Controller. Excellent value.